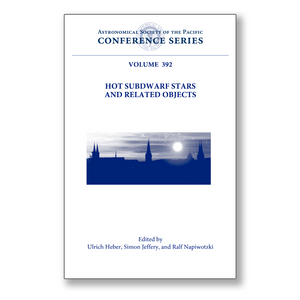 These are the proceedings of the third international workshop on Hot Subdwarf Stars and Related Objects, held in the historic city of Bamberg, Germany, in July 2007.
laboratories to study plasma processes in high-gravity atmospheres, including radiatively-driven atomic diffusion and its consequences for the chemical composition of the star's outer layers. laboratories for asteroseismology. Pulsations check the evolution models by giving direct measurements of mass and radius, and the potential to explore other internal properties. New instruments and theoretical models, as well as a vibrant young research community, are forcin rapid progress in all of these areas. These proceedings provide and informative snapshot of current research. They also include a small number of papers which have been extended to include an introduction for non-specialists. These papers offer a valuable resource useful to a wide audience including beginning graduate students and experienced reviewers for several years to come.